I was going to say that person walks a perfect sine line but you beat me to it. Nice long exposure. Very cool shot, and a nice bit of luck that Mr. Headlamp happened along when he did. Incredible shot! Your photos always amaze me. And above all, the stars our ethernal companions! 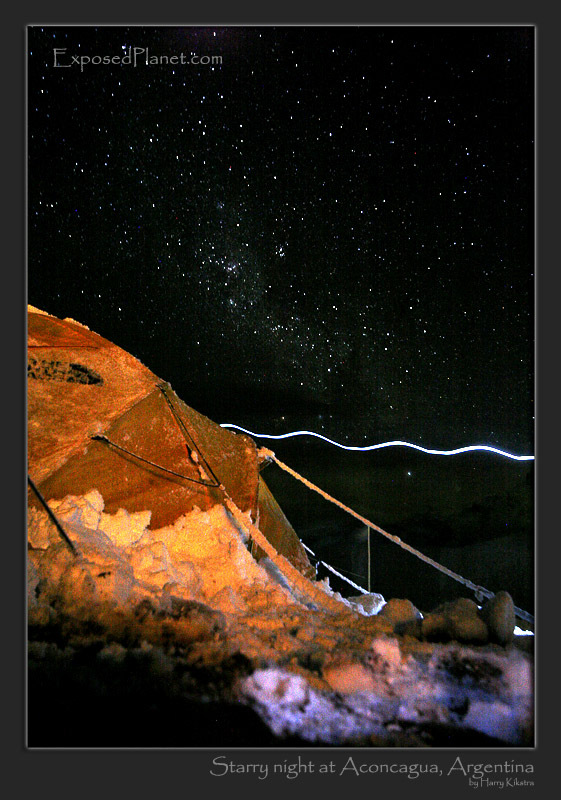 The story behind "Starry night at Confluencia camp on Aconcagua, Argentina"
A few weeks ago I joined one of the Aconcagua expeditions for a few days. Strangely enough we had a big snowblizzard already in first camp, Confluencia (3300m/11,000ft). But in the evening it cleared wonderfully to show the Milky Way, something I can never see from y home city due to the light pollution.